Introducing eKuore, the wireless electronic stethoscope with a Bluetooth connection to smartphones, tablets, speakers and headphones. A new and different way to auscultate. eKuore, currently manufactured in Spain, is a wireless stethoscope that can be used in conjunction with any smartphone or audio device. It has a built-in lithium-ion battery enabling 2 hours of charge and transmits sound 20 times louder than a standard stethoscope. It can be used with any iPhone (version 5.1 or later) or Android phone (version 2.3.3 or later). Initially targeted at veterinary practices, the eKuore will soon be available to the medical world. An easy to handle device such as this should allow doctors to monitor chronically ill patients, the elderly or those requiring dependent care which should potentially reduce the number of visits and assist with early diagnosis. 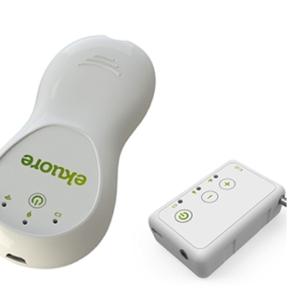 eKuore amplifies sound by a factor of 20 offering loud and clean auscultation whilst also removing unwanted background sounds; you can even listen in during a group-setting if you connect to the speakers, perfect for learning or teaching environments. eKuore also provides a totally free app that allows you to record, edit, play and share the auscultation results from wherever you are. You can get a second opinion from other country or manage patients who live in remote places; this is all now possible in a matter of seconds. Smart stethoscope eKuore Pro is currently in production with an expected release date for the end of 2015.